A Tribe Called Red member Ian "Deejay NDN" Campeau has tried to get the name of a local football team in Ottawa changed for over two years. Now he's taking his cause to the Ontario Human Rights Tribunal. The Ottawa Citizen reports Campeau filed a complaint on behalf of his daughter to get the National Capital Amateur Football Association to change the name of the Nepean Redskins as well as cartoon-like logos depicting natives. The musician is allowing the team five years to change the team name and uniforms due to the team's varying age groups and levels. He's also offering to host musical fundraisers to offset the cost of the changes. "If it was the Blackskins or Yellowskins this wouldn't even be a conversation," Campeau, an Ojibway, told the publication Tuesday. "But for the Redskins I have to file a human rights complaint. It's ludicrous." The musician said he filed the complaint after two lawyers offered to take the case to the human rights tribunal for free. He also said the term -- also used by the National Football League's Washington Redskins -- is deemed offensive in dictionaries. "I hope most people in Ottawa would agree that using a term defined as offensive for a youth football team is not appropriate. "The players call each other 'redskins' on the field. How are they going to differentiate the playing field from the schoolyard? What's going to stop them from calling my daughter a redskin in the schoolyard? That's as offensive as using the n-word." The team's president Steve Dean disagrees that name is offensive and told the CBC at a team practice on Tuesday night that the Ottawa Aboriginal Coalition have him permission to use the name. "We did reach out to the aboriginal community, we asked for their guidance on the use of the name, and we're actually advised to continue," Dean told CBC News. "Certainly the fact that the club presents such a positive influence in the community — and the name is synonymous with that — brings a positive light to the name." The singer also tweeted ) he was receiving threats posted on Ottawa rock radio station The Bear 106.9's Facebook page, with a picture of the post. In an earlier interview with HuffPost Canada Music, Campeau said that his activism against the football team was part of a broader movement. "Native people all over the Americas are standing up and taking their place in today's society. I don't think it's a coincidence that challenging the "redskin" name, A Tribe Called Red, or Idle No More are all happening to the first generation that weren't forced into residential schools. It was illegal for any First Nation to speak to a lawyer let alone challenge an NFL team in court. It's a sign that the times for First Nations in the Western Hemisphere are finally getting their civil rights movement. 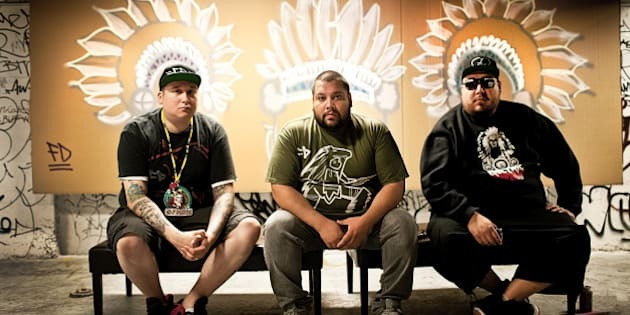 A Tribe Called Red are touring behind their sophomore album "Nation II Nation" which has been nominated for this year's Polaris Music Prize. The group have two Canadian dates this month before a mini-tour of Mexico begins next month. Additional Canadian and American shows are also confirmed for later in the year.